My problem–I’m aware that I have several, but I shall focus on this one for now–is that like many of us I take on too much with a complete disregard for how many hours there are in an actual day. Sleep? Whatever. Lunch? A chocolate pudding and a handful of Goldfish crackers at my desk. Somehow I never did master the art of saying no. And I also must have missed the lesson on “how to stay focussed.” Last night while researching a story I literally got lost on the internet. I fell down that slippery slope and slid so deep into the web that by the time I dug myself out, hours had passed and I was left dazed and confused. But there’s just so much to do (and so many hilarious Youtube videos to watch) that there really aren’t enough hours in the day and I end up feeling like a cat treading water. 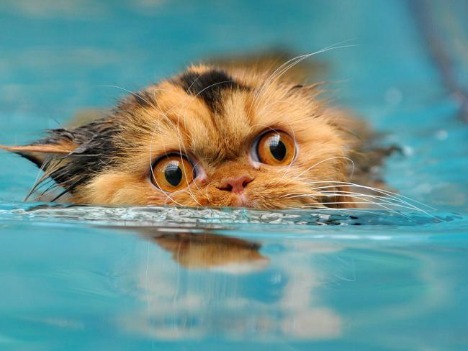 By the way, if you Google “cat treading water” nothing comes up. Know why? It’s because cats can’t tread water! They aren’t dolphins. Or catfish. I should really put my anti-feline bias aside and just admit that cats know a thing or two. They know better than to get in over their heads. So inside of writing this ridiculous post in an effort to avoid the actual work I need to get done, I’m going to log off and get to it. I’m also going to give myself permission to freak out a few more times before Christmas. You know, to get it out of my system because nobody wants to spend the holidays with someone who hisses like a feral cat. Cloudy With A Chance Of Toilet Water Rain Wordless Wednesday–Overwhelmed Really Kevin? ?